Germany runs a trade surplus overall, largely thanks to EU partners, which buy 57% of German exports. In 2012, Germany ran a trade deficit of €27B with energy producers Russia, Libya and Norway. In 2012, Germany had trade deficits with Japan (€4.7B) and China (€11.7B). 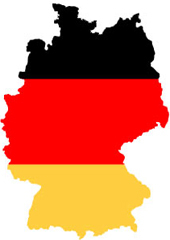 In 2012, Germany had a trade surplus with the eurozone of €54.6B. 1. Germany remains dependent on its neighbors, with 69% of total exports going to European countries. 2. 57% of Germany’s total exports go to the member states of the European Union. 3. In 2012, Germany ran a trade deficit of €27 billion with Russia, Libya and Norway, mainly for energy imports. 4. Germany also had trade deficits with Japan (€4.7 billion) and China (€11.7 billion). 5. In contrast, Germany had a trade surplus with the eurozone (e.g. France, Italy, Spain, Greece, Portugal, Cyprus and Ireland) of €54.6 billion.